It seems like every week brought another story of a large financial service company being sued for offering their employees bad options in their 401k plans this summer. 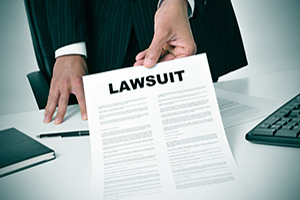 Over the past couple of years companies like Nationwide, Transamerica, MassMutual, Fidelity, and Ameriprise have all settled lawsuits with their employees. Evidently the attorneys smell blood in the water because this summer, lawsuits were brought against Edward Jones, Morgan Stanley, Franklin Templeton, and New York Life. While these aren’t surprising (more in a minute! ), it makes me wonder how long it will be before litigators turn their focus on plans at smaller businesses, an area that I think could be fruitful indeed. That the attorneys would start by targeting large companies with the deepest pockets makes sense. If you were going to spend a bunch of time on a project, wouldn’t you want the biggest reward you could get for your efforts? Such was the case when Nationwide settled for $140 million, Lockheed settled for $62 million, Boeing settled for $57 million, MassMutual settled for $31 million, and Ameriprise settled for $27 million. We’re talking some big money! I’m not an attorney, but I’m thinking that if my compensation was a percentage of the settlement, starting big is the way to go. While these companies admitted no wrong doing as part of the terms of their settlements, logic suggests that at some point, somebody did some mental math and decided settling was better than going to court. With the Tibble v. Edison case making it all the way to the Supreme Court last year, the courts have made it pretty clear that plan sponsors have an ongoing duty to monitor investments offered to plan participants and to make sure that fees are reasonable. That particular case is still in the courts, but it would appear the path is now clear for litigators. If plan sponsors haven’t been monitoring the investment options in their plans and making sure the fees are reasonable, they could be opening themselves up to a lawsuit. While the deep pockets first approach makes sense, it’s not hard to imagine this becoming a cottage industry providing full employment to lots of new attorneys that want to specialize in this niche. Based on a report from PlanSponsor magazine the top two Recordkeepers in the small plan (less than $10 million in assets) space are Paychex and ADP. The two of them have a combined total of over 125,000 of these small plans. The point is there are a lot of small businesses with plans out there, and it is the small plans that I think are least likely to have advisors helping them understand their liability exposure and what they need to do to manage it. While maybe not quite as tempting as the big targets, this could be a good “volume” strategy. Part of the problem is that these small plans are most likely to not be dealing with an advisor that is acting as a fiduciary. A fiduciary is legally obligated to put your interests first, not just sell you their plan. They are also much more likely to have a plan where the service providers are compensated with some form of revenue sharing. Revenue sharing is basically where the funds in the plan pay money back to the plan recordkeepers and advisors providing those services to the plan. These agreements are very difficult for plan sponsors to understand and track, and that makes it almost impossible for them to monitor the costs in their plans to make sure they’re reasonable, which the Supreme Court just reminded us is required. Lawsuit anyone? While you may be wondering, why would I even want to offer my employees this benefit, I would say don’t panic. This can be fixed! 401k plans can still be a great tool to save for retirement in a tax advantaged way, and can be invaluable in helping you attract and retain the best people for your company. They are however not a set it and forget it thing. They need to be monitored, and when done properly, your exposure to this type of liability can be significantly reduced.